Weathered furniture looks wonderfully authentic in any beach style decor or coastal cottage. 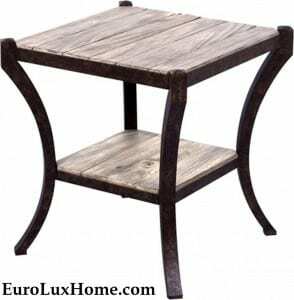 But the relaxed look of weathered furniture can work with any home decor style. It always adds a lived-in charm that looks comfortable, casual, and welcoming. You can hunt around to find vintage furniture that is naturally weathered by the years, but you can also find lots of new weathered furniture in many styles. Kick back and enjoy some inspiration for new weathered furniture crafted with different techniques. These pieces are so convincing, you will believe that they have been naturally aged by the elements! The skillful rubbed finish on this teal blue painted sideboard by Furniture Classics shows how effective a weathered painted finish can be! 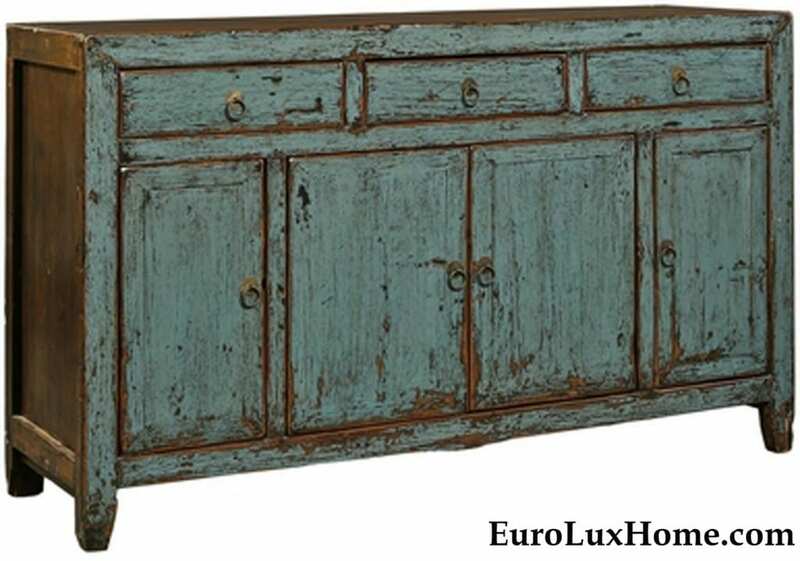 The sideboard would look wonderful in a rustic kitchen or dining room, whether it is decorated in a coastal style or with a romantic Boho look, or perhaps in a Mediterranean style. Either way, the sideboard adds a splash of color and tons of character. The weathered hand-painted finish on this carved wood sconce looks incredible. You could easily believe that the sconce was found in an abandoned castle in the countryside somewhere in Europe. The carved and hand-painted China Wind sconce is crafted with decadent style, in a charcoal gray finish that will work beautifully in many color schemes. 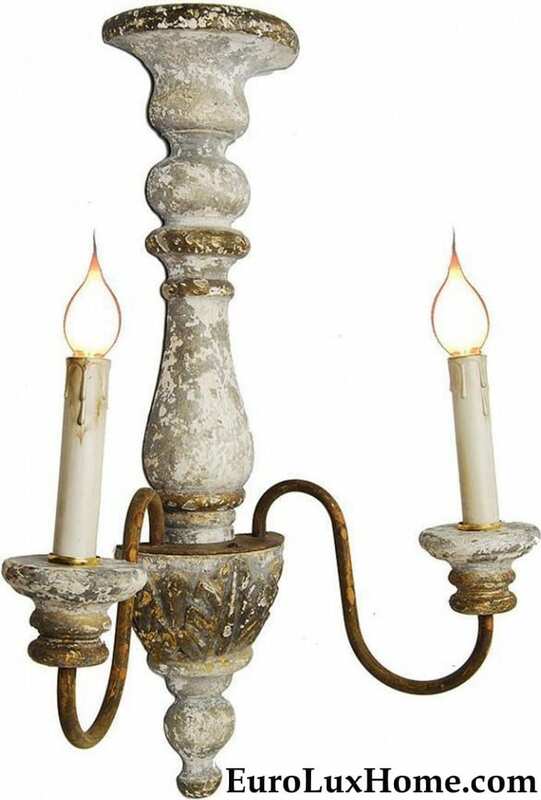 It is nicely sized at 20 inches high and the hand-painted weathered finish on the carved wood is enhanced by the rusted metal arms. It’s perfect for a nautical interior design scheme! Reclaimed wood is a great choice to give a weathered look as the wood is already naturally weathered and aged. This Furniture Classics reclaimed elm cabinet is a perfect example. The reclaimed elm wood looks beautifully aged and weathered as though it has been a family favorite for many years. The cabinet would look happily at home in any rustic style decor, including Farmhouse style. The metal hardware adds to the sense of substance. The reclaimed wood with its textured grain would also look great in a Scandinavian style room. It is packed with Hygge appeal – the Danish style that symbolizes homestyle comfort and cosiness. There is no pretentiousness here, just a sturdy cabinet that is easy to live with. Also crafted in reclaimed wood, this time pine, this new Furniture Classics coffee table has a driftwood finish that makes it especially great for a coastal cottage or condo. The stripped finish is brushed and then allowed to age in a natural state to get a driftwood effect. Chunky baluster style legs are the perfect complement to the planked table. This reclaimed pine table invites everyone to gather round and relax! If you like the driftwood look, then in addition to the reclaimed wood table above, you will admire the weathered driftwood finish on this new Scarborough House pedestal side table. The weathered parchment finish gives a driftwood effect. 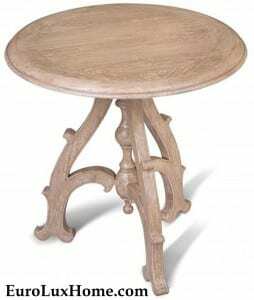 The pale distressed patina is so versatile, this side table would work as well in a contemporary room as it would in a more rustic or Farmhouse setting. I can picture it being a terrific match for your Scandinavian style decor too! We also love this other new Scarborough House weathered side table that has a completely different look. 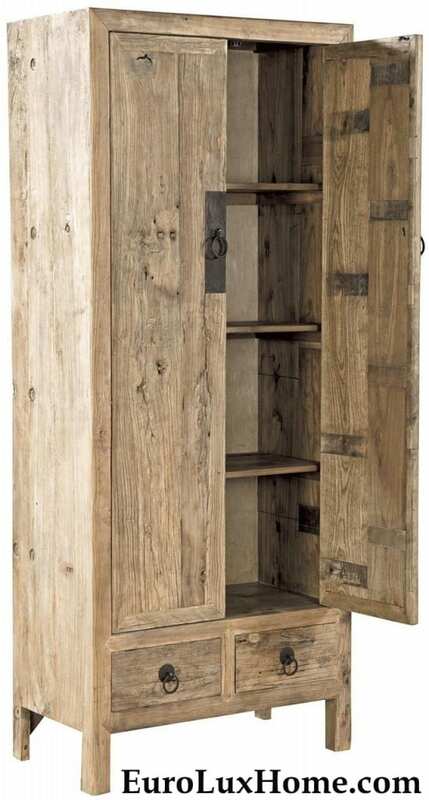 It is crafted with a bleached wood top and lower shelf, creating the weathered effect. It looks like the table has been left out in the sun to naturally age! The rust finish on the metal legs adds to the natural maritime appeal. It’s a lovely table for your rustic cabin or beach house, and we think it would be a nice fit for a conservatory or covered patio area too. This entry was posted in Home Design Ideas and tagged distressed furniture, expert craftsmanship, Furniture Classics, painted wood, reclaimed wood, rustic decor, Scarborough House, weathered furniture on May 1, 2017 by admin.